Motivating our kids to stay active and exercise can be quite a job! With child obesity a global concern, coupled with the excessive use of the internet, computer games and mobile phones, our children are in danger of effecting their long term health and wellbeing. For a number of years now, I’ve been working with children of all ages and abilities using yoga, dance and a variety of fitness modules to encourage regular exercise. All are effective but it’s the yoga that has their attention the most and inspires the majority to participate. 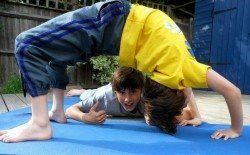 There are lots of fabulous and inspirational yoga teachers out there who teach children. However, I’ve found the best way to motivate my two boys, Tyler and Corben, is to practice at home. Be sure to keep it very simple and fun. Exploring a little yoga sequence or posture every day seems to ensure a regular practice. 4. Place your hands behind you, bend your knees with feet flat on the floor – inhale and lift your hips high to the sky, look up. You’ll want to make some sounds on that exhale…arrrrgghhhh is usually a good one! Do you practice yoga with your kids? Have you any further tips and ideas to offer here? Please take a moment to comment or ask questions.Thank you for reading and please feel free to share.